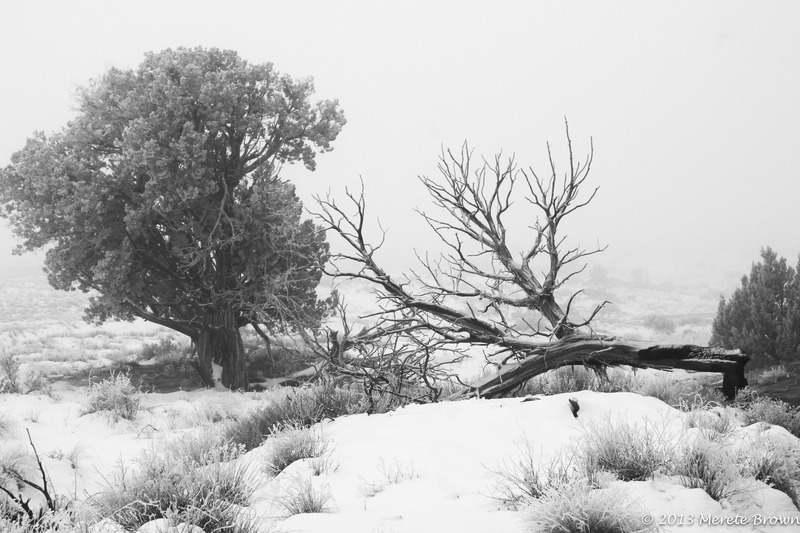 Each year, as the seasons pass by, many of the national parks are cast in a new light. 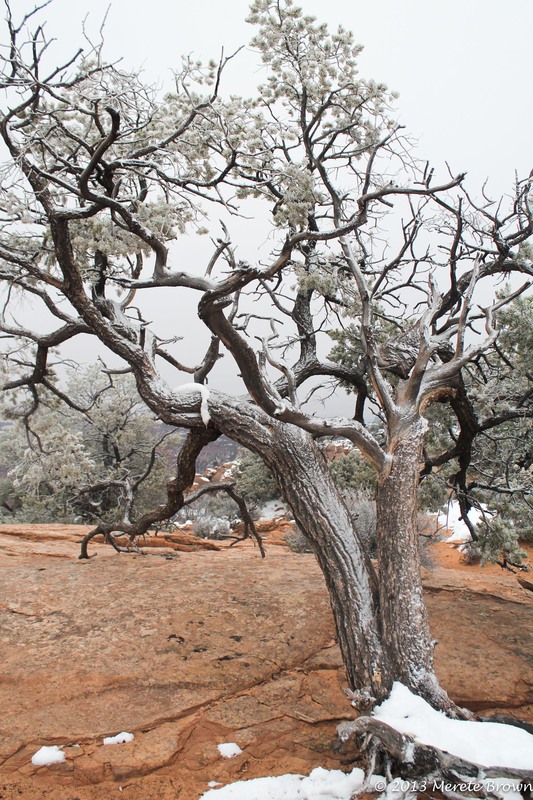 We weren’t exactly sure what to expect when we decided to visit Canyonlands National Park in late November, but as we drove towards the Island in the Sky Visitor Center, we entered a scene that was hard to imagine, surrounded by the desert topography. 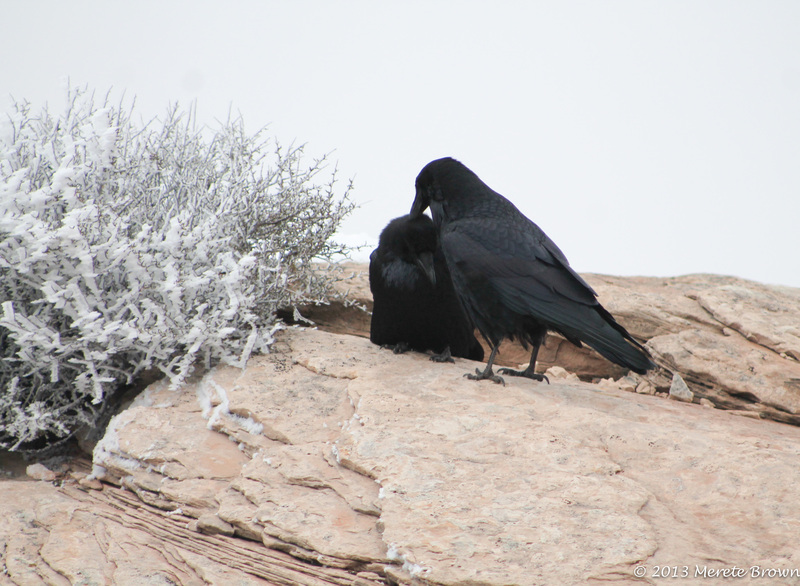 Snow covered the park, grazing the canyon walls. 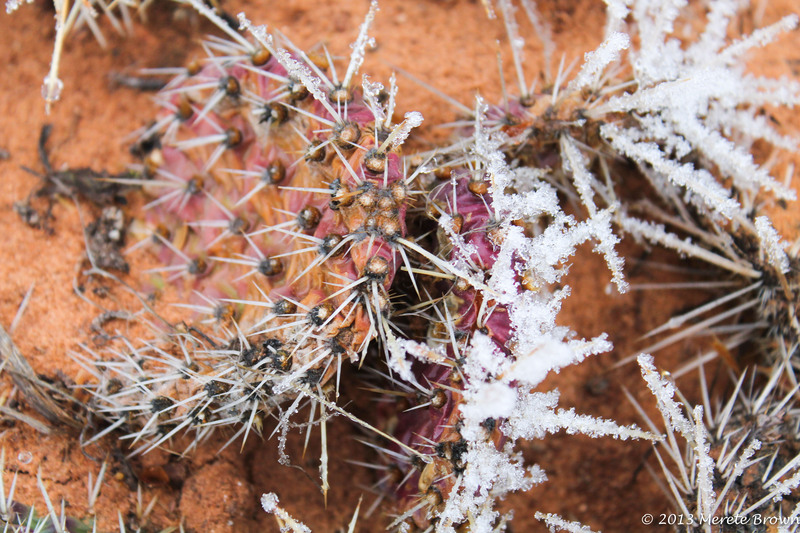 The red clay like ground was covered in white snow. 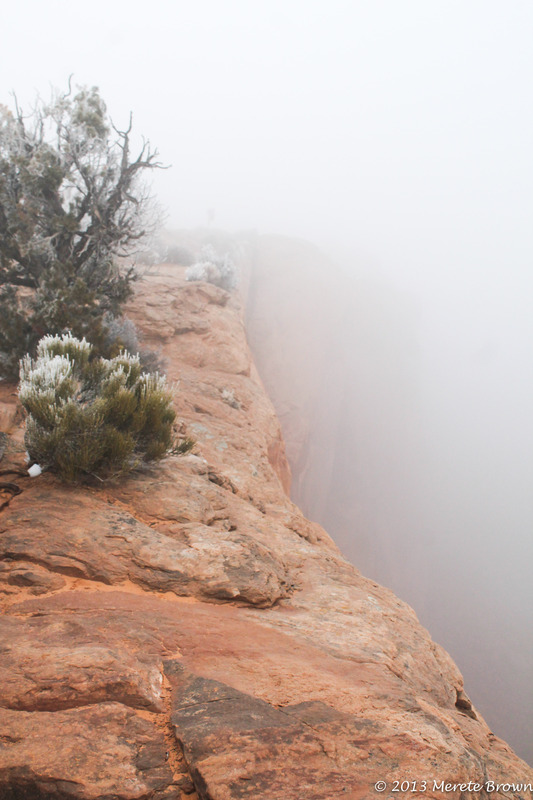 Fog enveloped the entire area, slithering in and out of the canyons, constructing a gray barrier to any view. 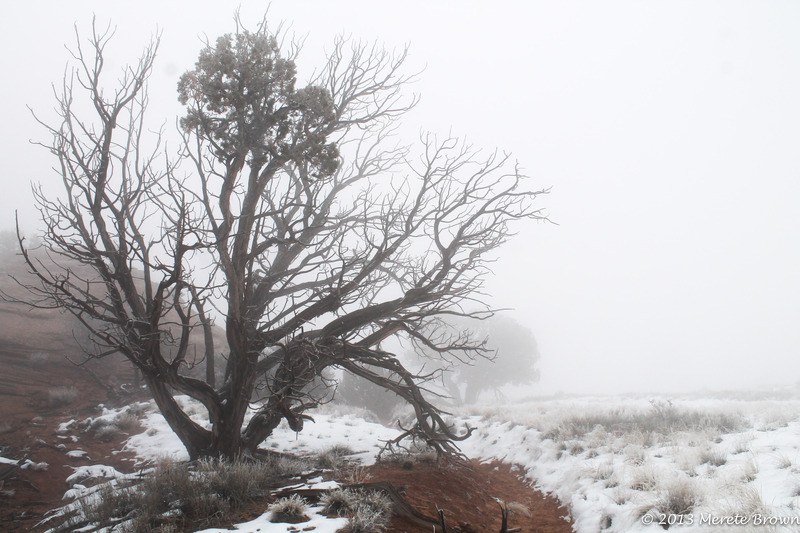 The cold crept in as we ventured out into the fog on the trail towards Aztec Butte, waiting for new pieces of the landscape to pop out. 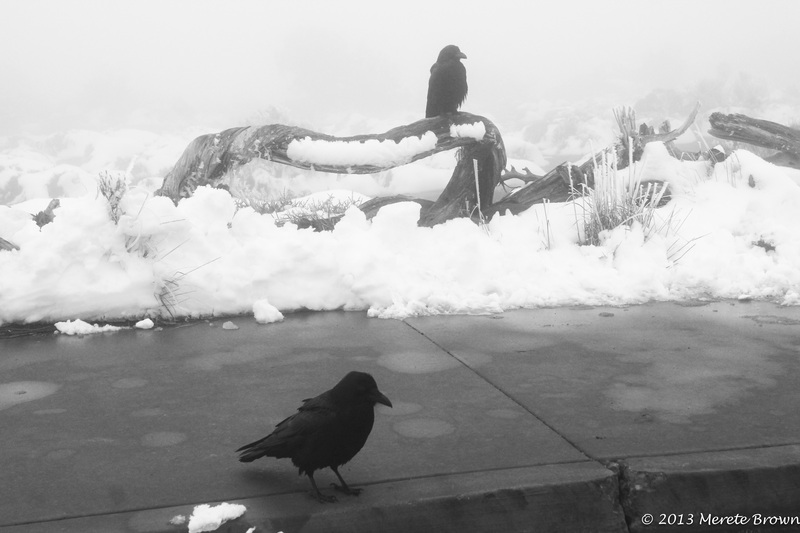 We embarked on a true adventure as we constantly guessed what lied beyond the fog line. 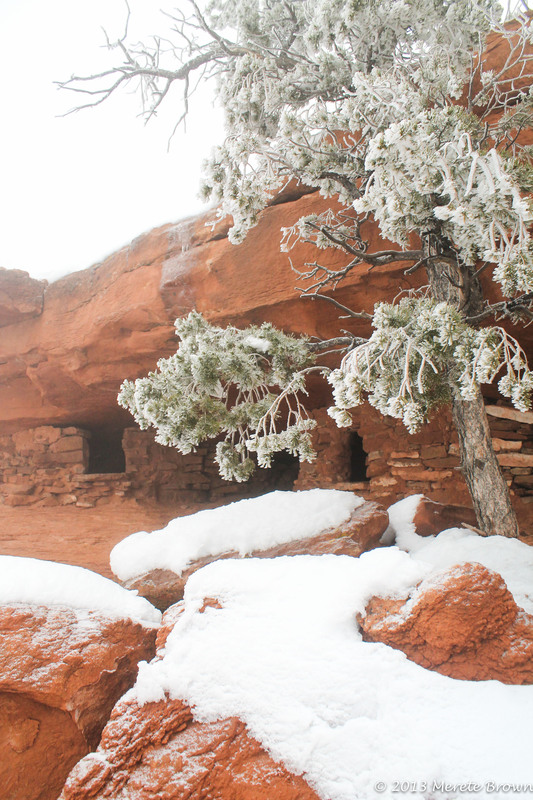 We reached the ruins of a granary, hidden on the hillside, used by the Anasazi Indians back in 1300 A.D. 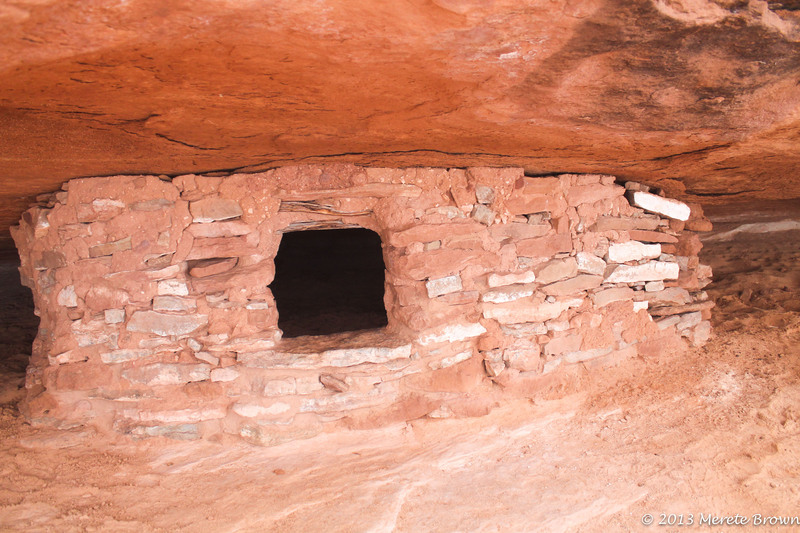 The mesa top provided a sanctuary from the wet, cold air. 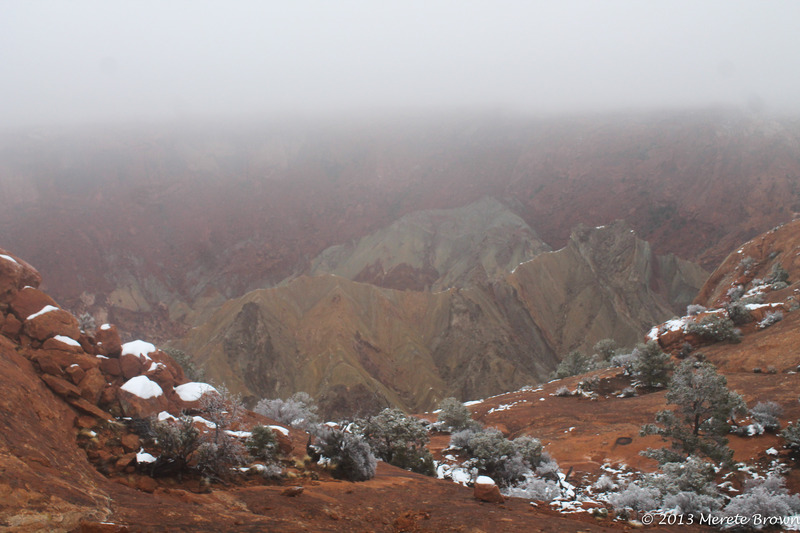 We hiked back towards the car to continue through the fog to Upheaval Dome. 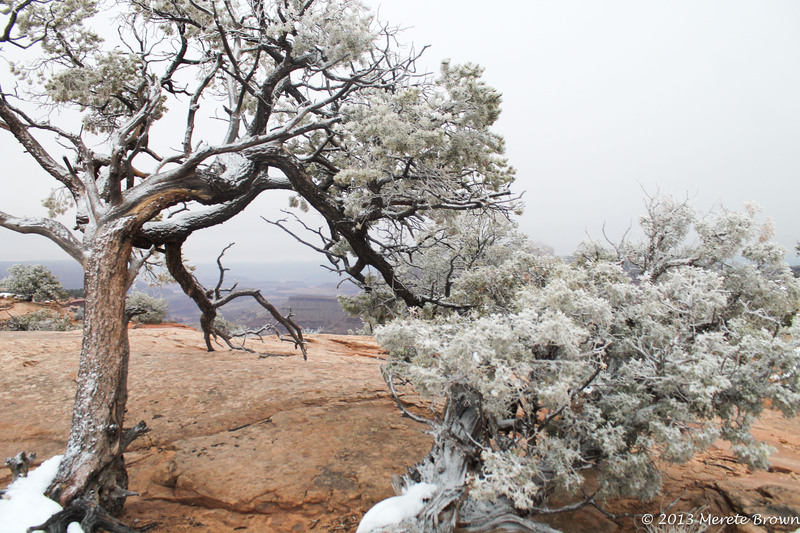 At the dome, we hiked around the crater caused by a meteor impact according to the latest scientific theories. 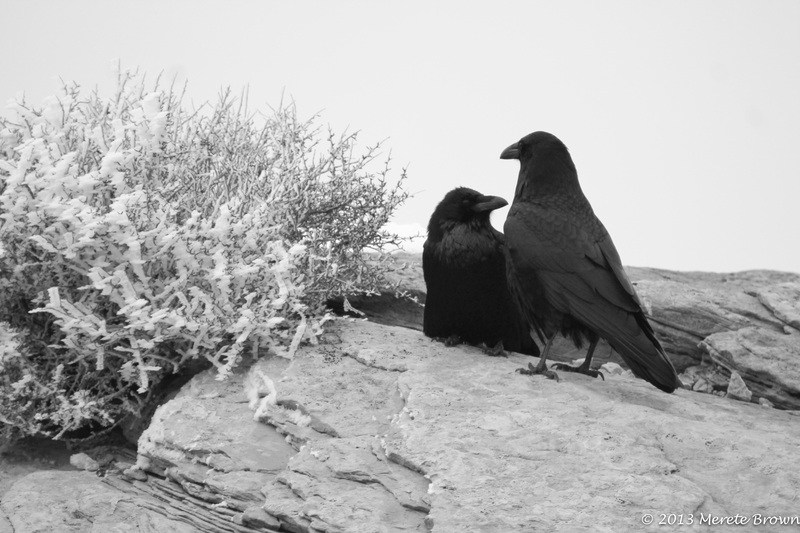 Next stop was Grand View Point Overlook which was completely cloaked in a gray mist except for a few stray crows waiting for a lucky bite to eat. 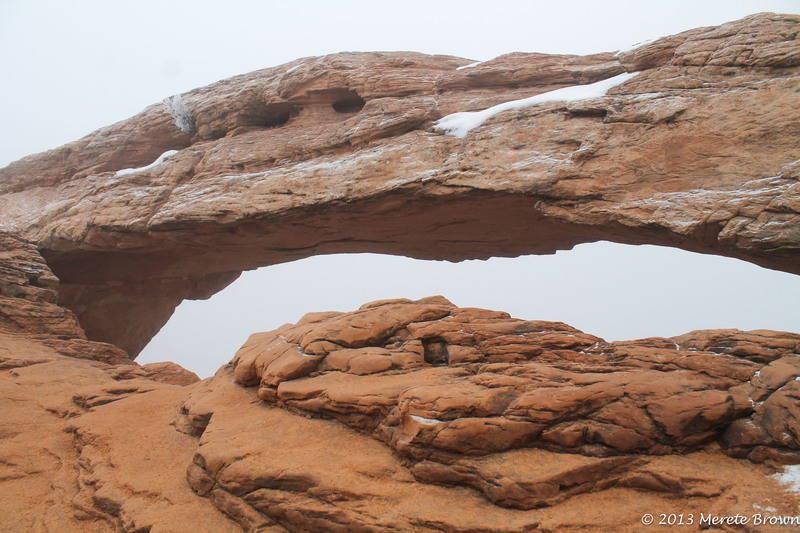 Although we knew Mesa Arch was likely surrounded by fog too, we stopped off to see the famous view. 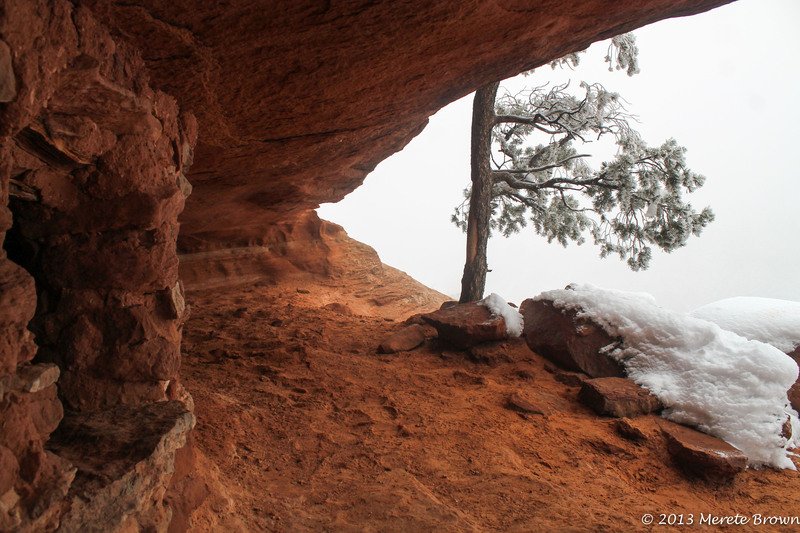 A sheer fog wall dropping into oblivion was the only thing standing between the arched rock and the bottom of the canyon. 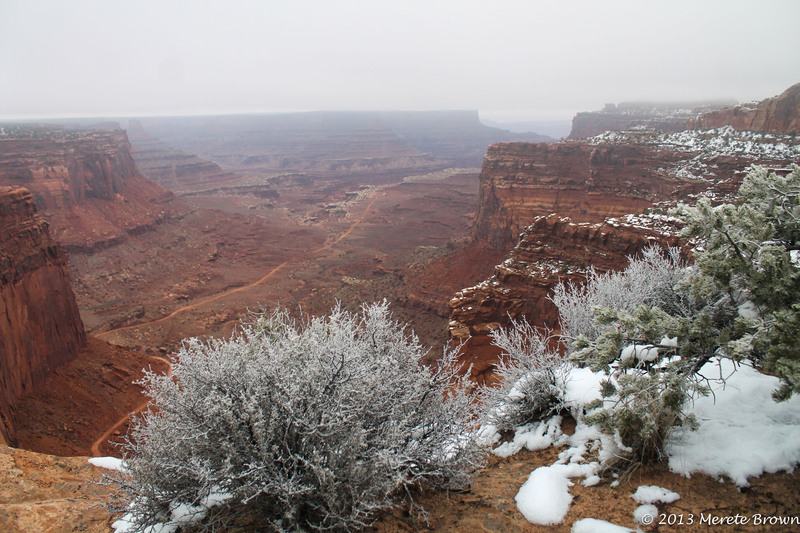 As we headed back out of the park, finally accepting defeat to the fog, we reached Shafer Canyon. 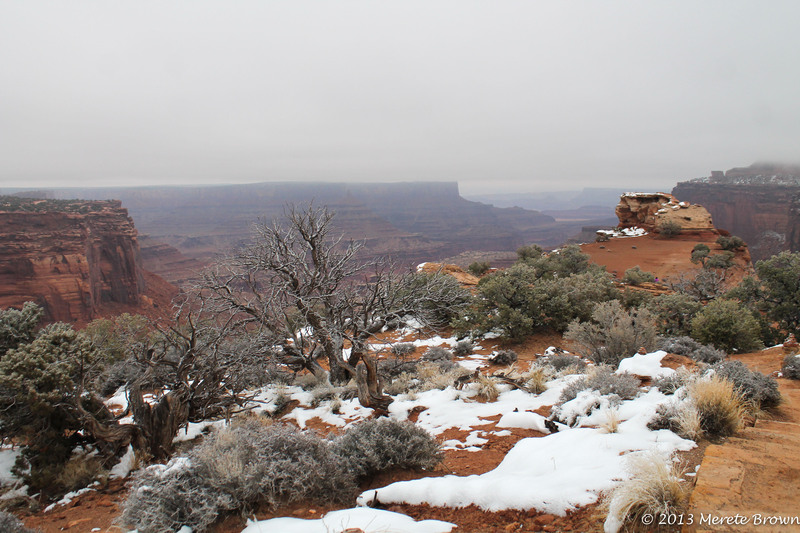 Amazingly, the fog level lifted, and the canyon sprawled out before us. 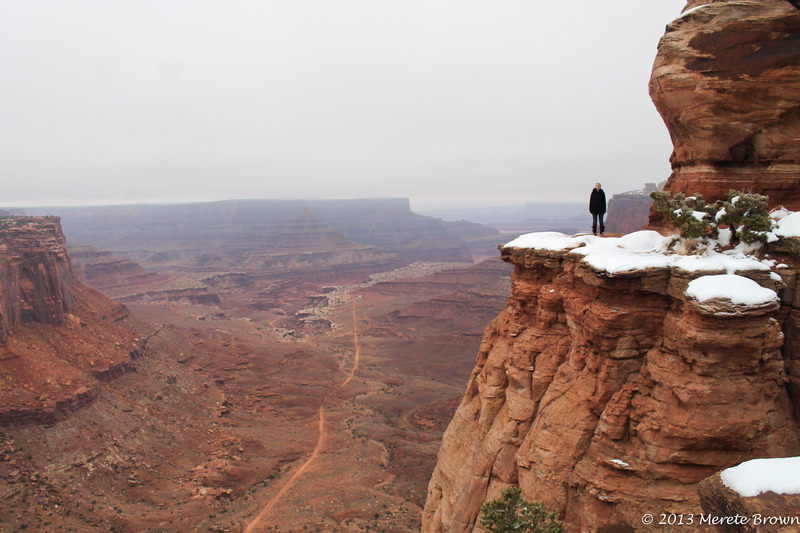 At Shafer Canyon Overlook, as cliche as it is, it felt like standing on top of the world, surrounded only by the fierce power of nature. 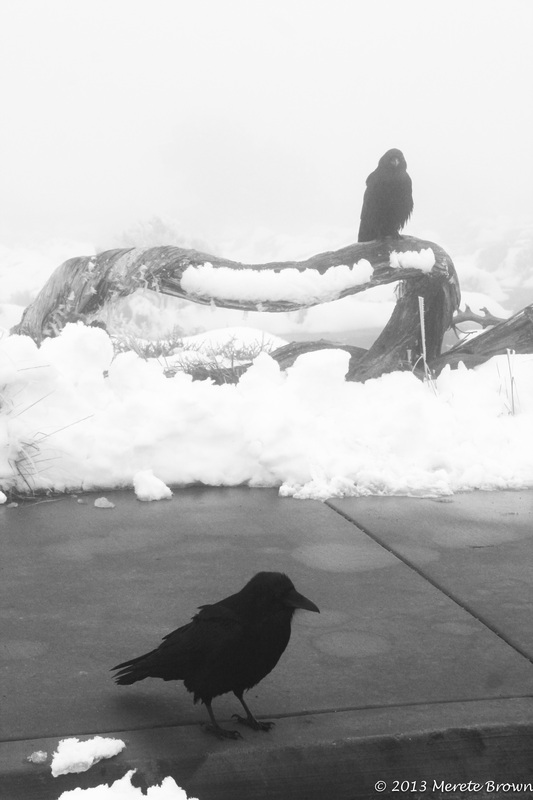 At the Island in the Sky Visitor Center, the fog faded away too. 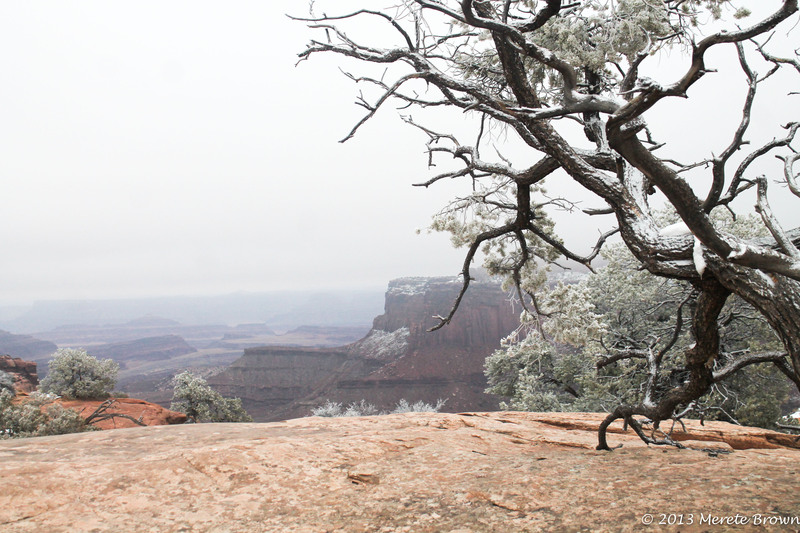 A solemn tree stood striking out towards the canyon below. 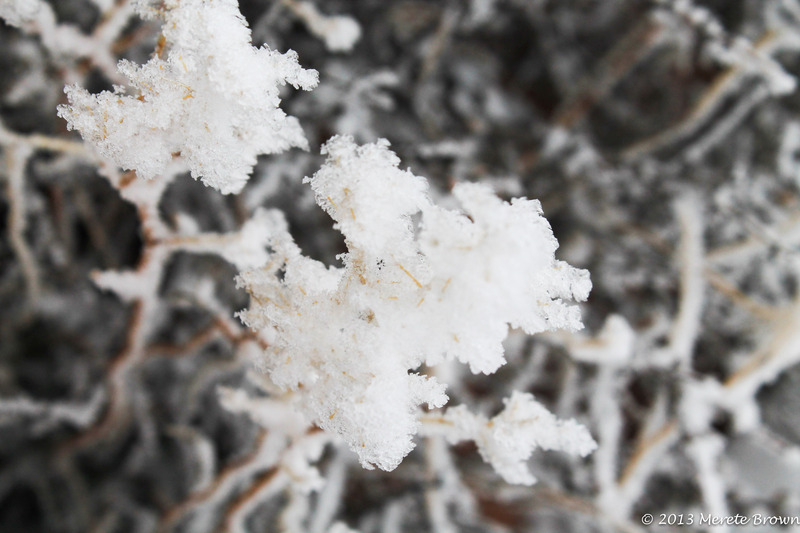 The best adventures are often the unexpected ones. 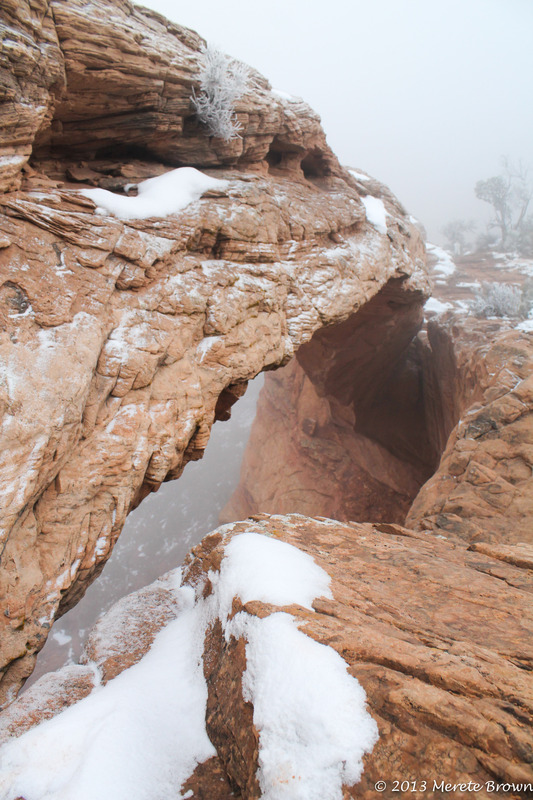 We didn’t think we’d be surrounded by a dense fog the majority of the day, but it resulted in a fun and interesting way to experience Canyonlands National Park. It also gave us another reason to return later in the year. 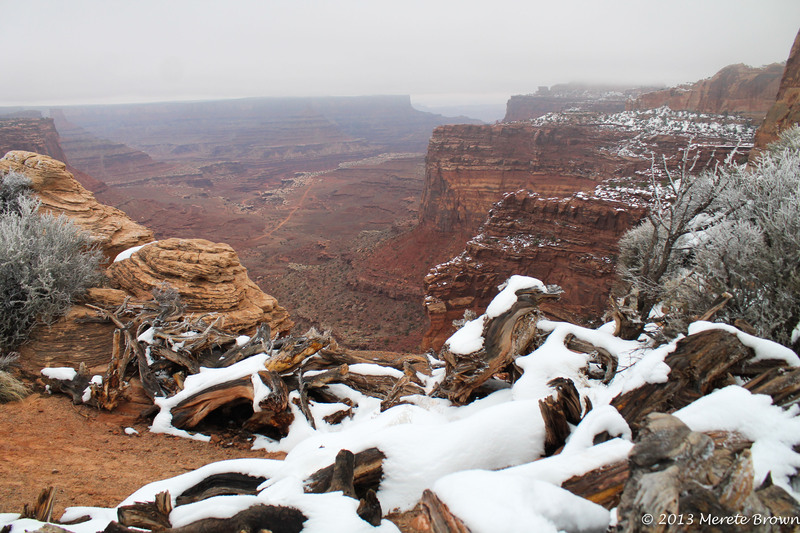 How large is Canyonlands National Park? 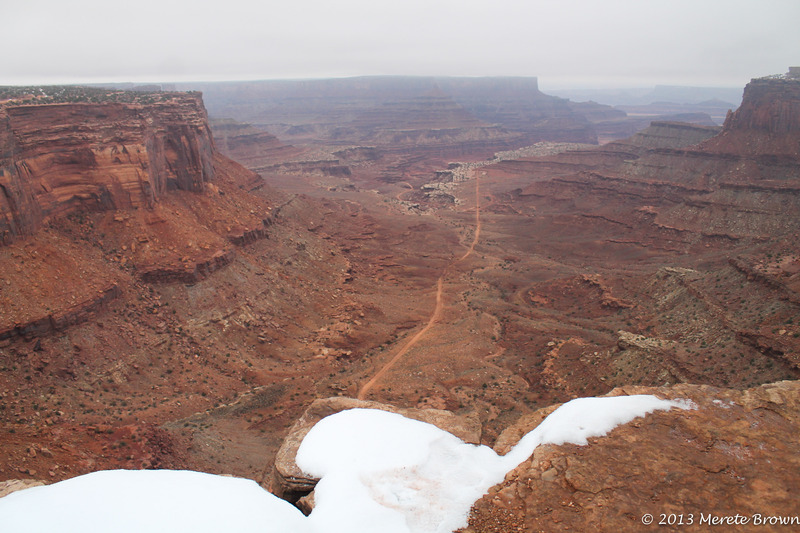 Canyonlands is actually made up of four districts: Island in the Sky, the Maze, the Needles and the rivers themselves. 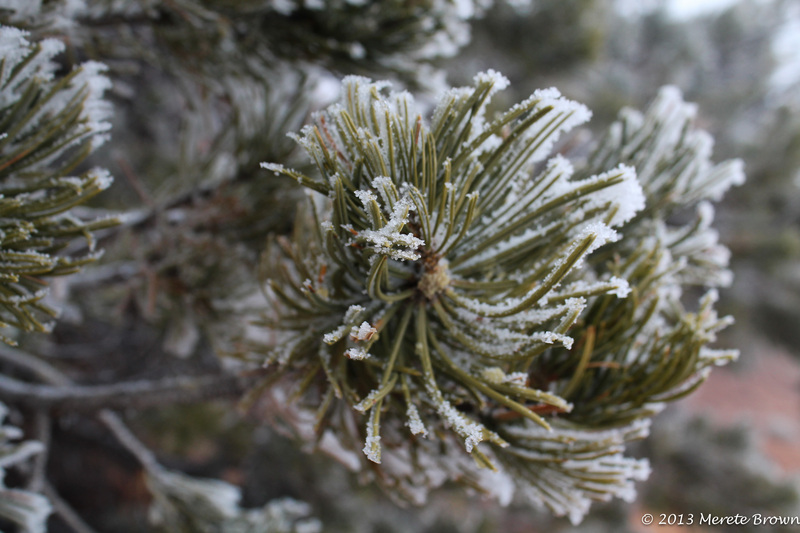 Total the park encompasses 337,598 acres. 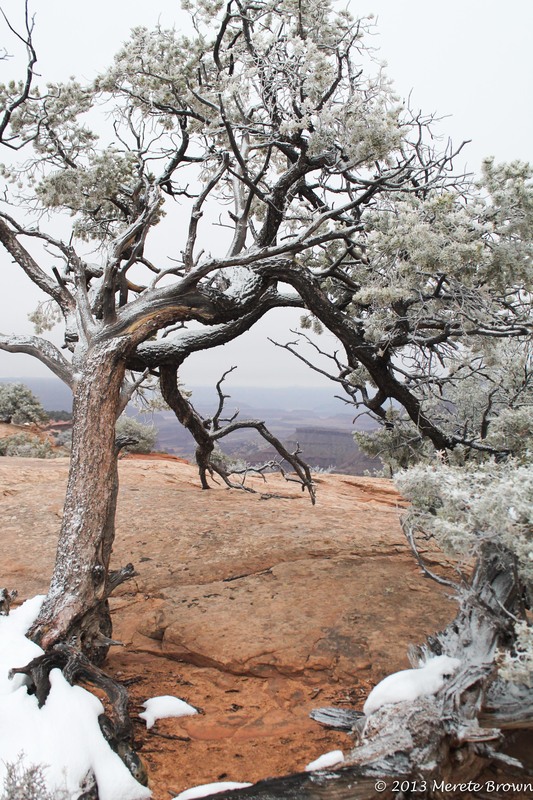 Canyonlands is well known for its backcountry areas. 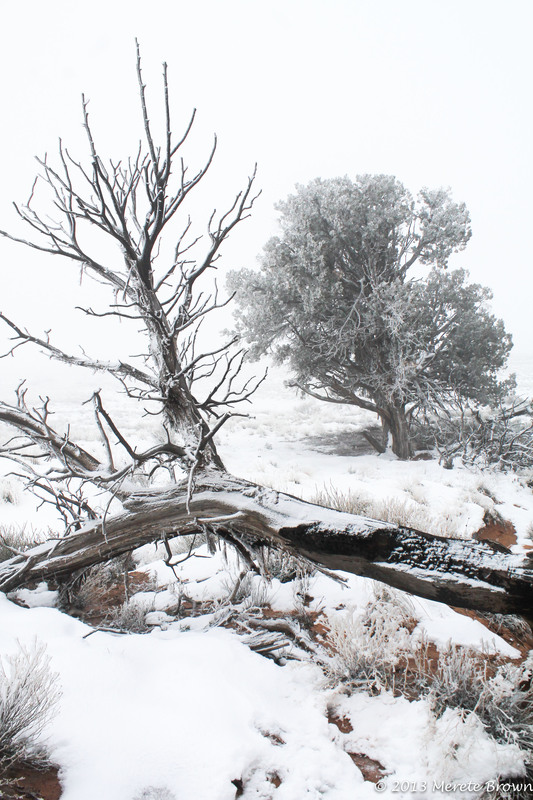 How do you obtain a backcountry permit? 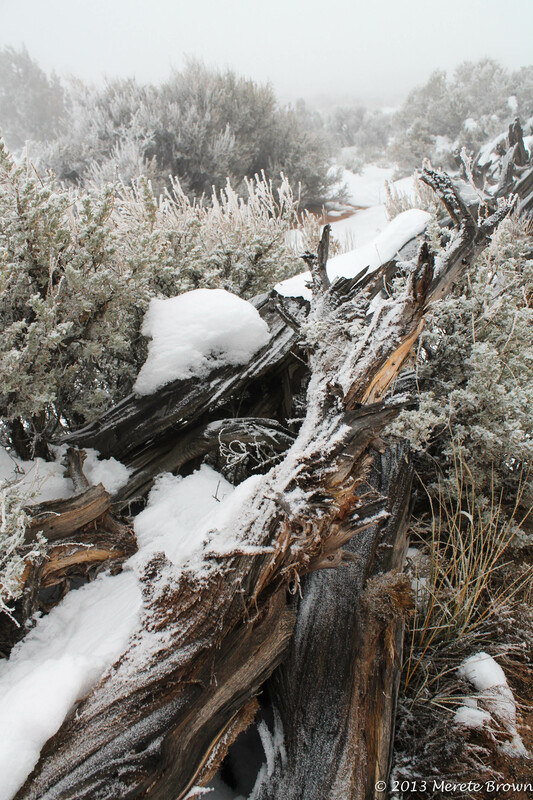 Permits can be purchased at the district visitor centers and the Hans Flat Ranger Station. 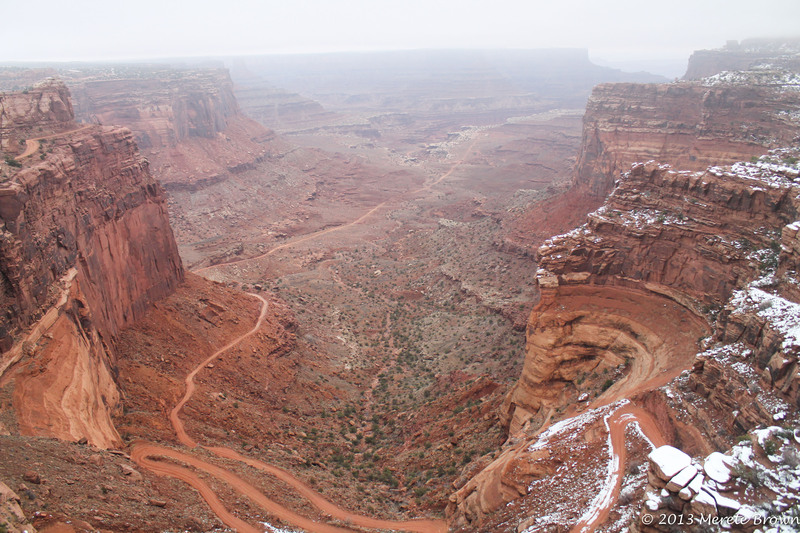 Moab is popular for ATV riders. Can you ride ATVs in the park? No, unfortunately not. 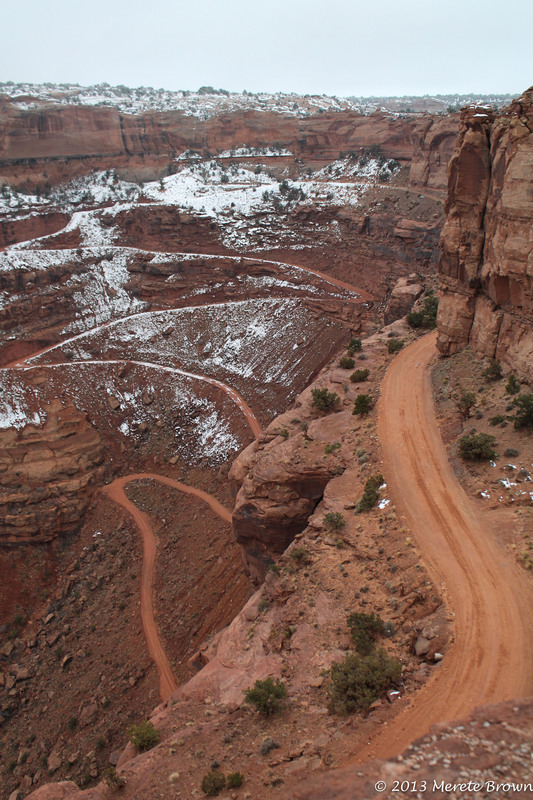 What vehicles are suitable for off-roading in Canyonlands? 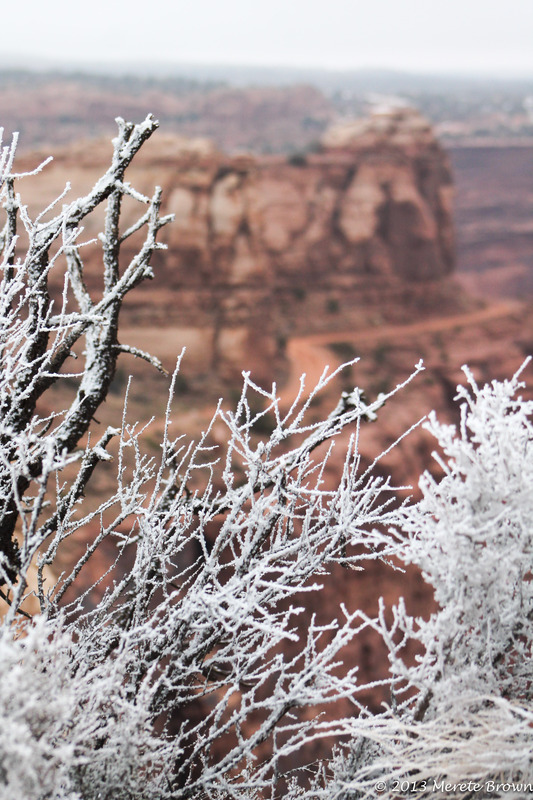 Standard four-wheel-drive vehicles, with high-clearance and a low gear range, are recommended for all four-wheel-drive roads in Canyonlands.